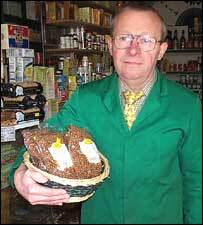 A delicatessen owner in Driffield is trying to revive an East Yorkshire eating tradition. Carlin peas are traditionally eaten on the Sunday after Mothering Sunday which falls this weekend. And this year Ken Bentley has been promoting them heavily from his shop in the Market Place. "Carlins are also known as the maple pea or the brown pea," he explained to BBC Radio Humberside. "We soak them overnight and then boil them for two hours." At home they are then roasted in beef dripping and eaten as a snack. Mr Bentley says the tradition of eating carlins goes back to the days of Robert the Bruce in 1327. His soldiers laid siege to Newcastle cutting off supplies in an attempt to starve the inhabitants into submission. Then on Passion Sunday, two weeks before Easter, a ship arrived from Norway carrying a cargo of carlins. So the inhabitants of Newcastle were saved and the Scots left to attack somewhere else instead. The tradition of eating them started to die away in the 1950s. "Over the years, more and more places have stopped selling them," Mr Bentley added. "We are one of the few shops that still cooks and sells them." Mr Bentley says that trade in carlin peas has been particularly good this year and he will be eating some himself on Sunday. "I'm very partial to them."